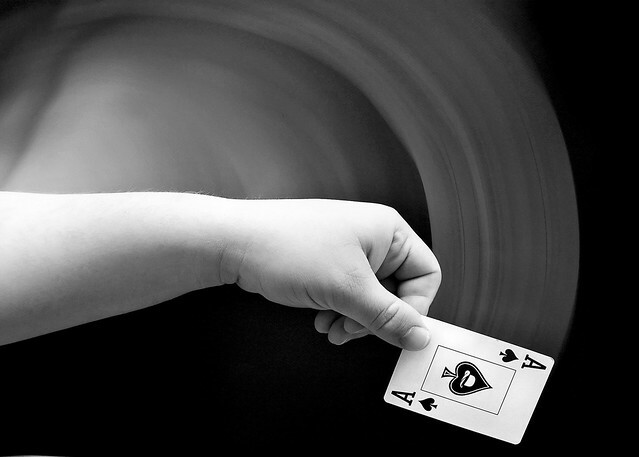 Dealing Cards in Slow Motion and Rear Curtain Flash | Flickr - Photo Sharing! An experiment using second curtain flash with my Canon 5D and Canon Speedlite 580EX. Box of Light, WisDoc, The New No. 2, and 292 other people added this photo to their favorites. That reminds me of a photo I took except I used a point-and-shoot camera and a joker. I like how your's is very clean and smooth though. Great job! Join the High Fidelity Photo Art Group and upload it! Great experiment with wonderful result! Yes, I second that, great experiment and great photo! Hi, I'm an admin for a group called High Fidelity Photo Art: 25.000 FOTOS!!! (post3,Comment any2), and we'd love to have this added to the group! Wow, great shot!!! Is that possible to take a shot using the same technique with an EOS XSi and the built-in flash? There is no rear/front curtain sync settings to change, but someone told me it can be done in manual exposure changing the flash sync speed. I really like this, great use of slow synch flash. Hi, I'm an admin for a group called simply elegance, and we'd love to have this added to the group! Would it be possible for me to use this shot as an example of a technique in a (unpaid) presentation I'm giving to our local photography club? I'd certainly give you photo credit. That came out just great :). I played with some flash settings but I did not have time to explore too much. This is awesome!